A list of exhibitions, lectures, workshops coming up. 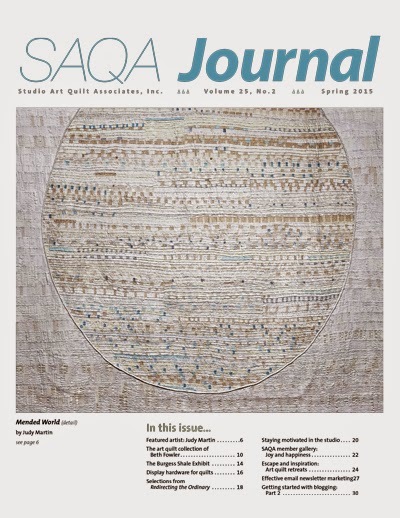 Judith e Martin was featured in the spring 2015 edition of the Studio Art Quilts Association Journal. The article is by Martha Sielman. 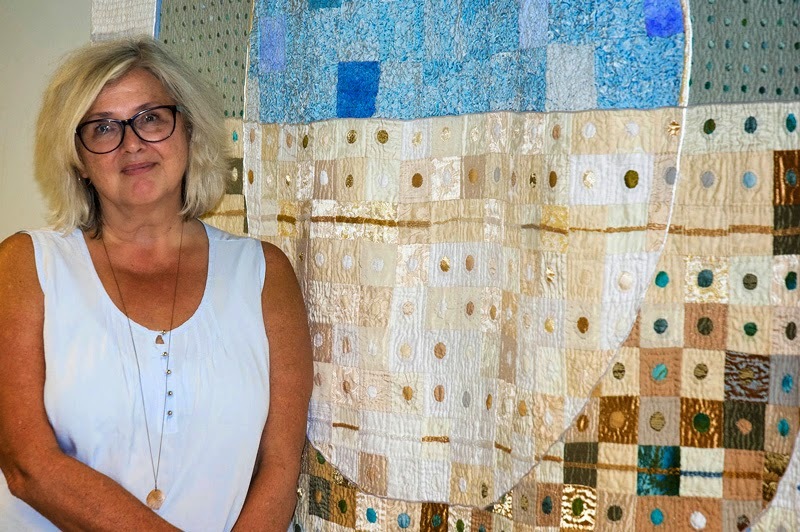 Known for her dense hand stitching, Judy’s art explores the process of making. For her, this process is more important than the outcome. In a speech she gave about a community meditation project she organized, she said, “Making something slowly with one’s hands is perhaps one of the most nourishing things one can do. Creating something from nothing – or better, creating something new from something no longer needed or wanted is healing for the planet and for us.” The Manitoulin Circle Project for which Judy was the lead artist brought together over 140 women over four years from 2009 to 2013 to create four huge 90”-square panels, which are now installed permanently in the Little Current United Church sanctuary. Wool is a favorite fiber. Judy especially enjoys repurposing old blankets with their layers of inherent meaning and history. 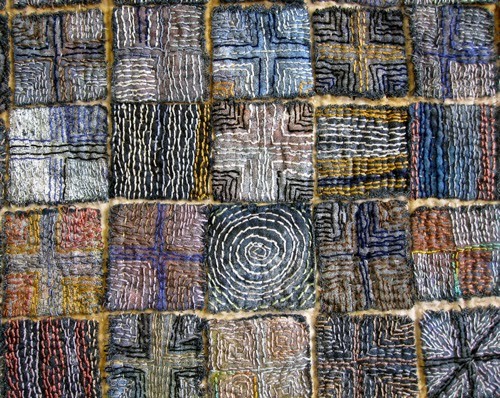 She says that blanket-weight wool is an excellent material for a Canadian artist because of the climate. She dyes much of the fiber she uses with natural dyes extracted from local plants in Ontario. However, Judy also uses silk, linen, cotton and enjoys ordering small samples of unusual threads via the Internet just to experiment with them. 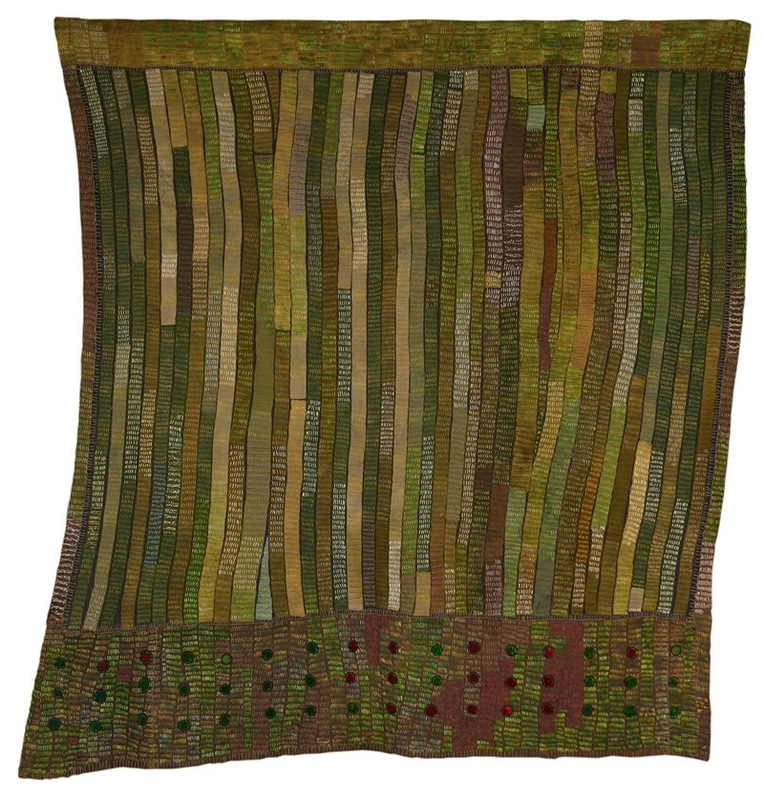 Thread is intrinsic to Judy’s work because hand-stitched marks are the essence of her art. Not to know but to go on was begun when Judy was about to turn 60. 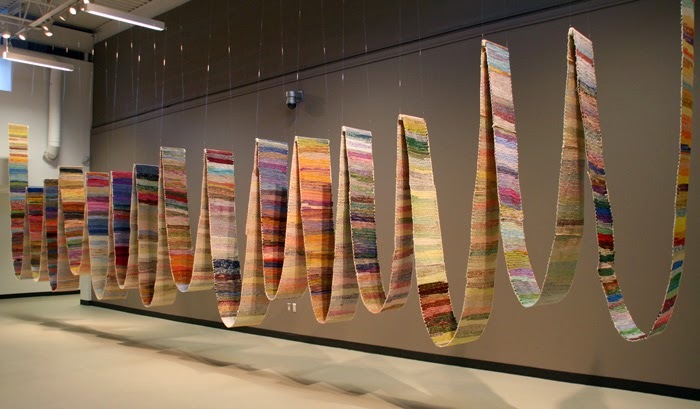 She wanted to record the passage of time, so every day she chose a few pieces of fabric from her scrap baskets, tore them into ¾” strips, folded the strips in on themselves lengthwise, and then stitched over the entire strip, attaching it to a 14”-wide canvas background. Each day she chose a color of embroidery floss randomly from her basket. Each day she stitched until she had used up the entire skein. For three years, each day was marked by a different color of thread but often the same base fabric was continued until that scrap was used up. These 223 feet recorded the daily passage of Judy’s time and intention. Judy spends most mornings either sitting on her deck or in a sunny window overlooking the lake and stitching for about three hours. After chores and a walk, she goes to her studio to plan out new work and do any machine sewing. She also presents lectures on how her work combines concerns for the environment with a love of poetry and the life-changing effects of motherhood. She is again teaching workshops, as well as leading another slow stitch. Her most recent personal project was a response to a call for an exhibition entitled Wild Pure Aesthetic Wonder, curated by Gloria Hickey and Philippa Jones. 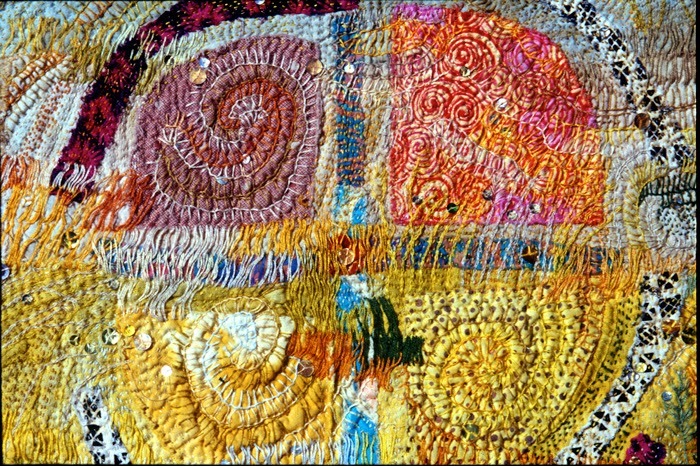 It will be exhibited at the Newfoundland and Labrador Craft Council’s Fibre Conference in Gros Morne, Newfoundland, in October 2015. Then she began stitching. She wanted to transform the wool from something meaningful in its own right to something that used all those qualities but added the emotion and self-revelation that art brings. She found that for this piece, sticking with her preferred minimalist aesthetic was more challenging than usual. The materials were so luxurious that it was constantly tempting to become more elaborate, but she wanted the aesthetic to be simple and pared down. She was so inspired by the wool, the earthy warm brown of the reclaimed over-dyed wool blanket (previously pink), that she is now planning to expand the process in order to make a room-sized installation that will include several blankets. In September, with three blankets started, Judy went with her husband to Newfoundland in order to visit both Gros Morne and the Viking settlement on the upper Western Peninsula. In Newfoundland she found “everything and more as far as wildness, pureness, and aesthetic wonder are concerned.” And she returned inspired to choose one of the three blankets and complete it. Beginning with Time is a large piece (78” x 90”), and it covered her entire design wall. 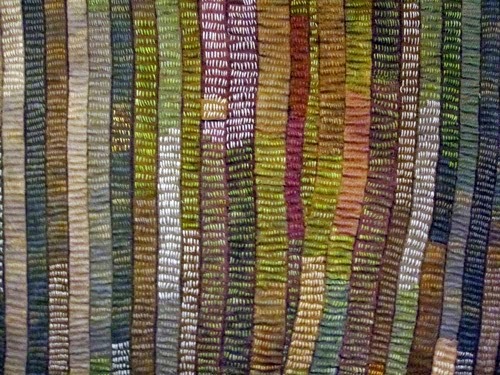 Both sides are filled with dense, ordered columns of seed stitch in wool yarns. Judy has titled one side Beginning with Time: Day and the other Beginning with Time: Night. “I hope that what my work communicates is the quiet joy of making and at the same time the feeling that we are each just a tiny speck. This piece has taken on a stubborn silent quality - it will not be defeated. The dots below the horizon are perhaps the safety net I think about or represent a depth we cannot fathom. There is no eye level focal point. Instead, it evokes a feeling of being lost in the woods. 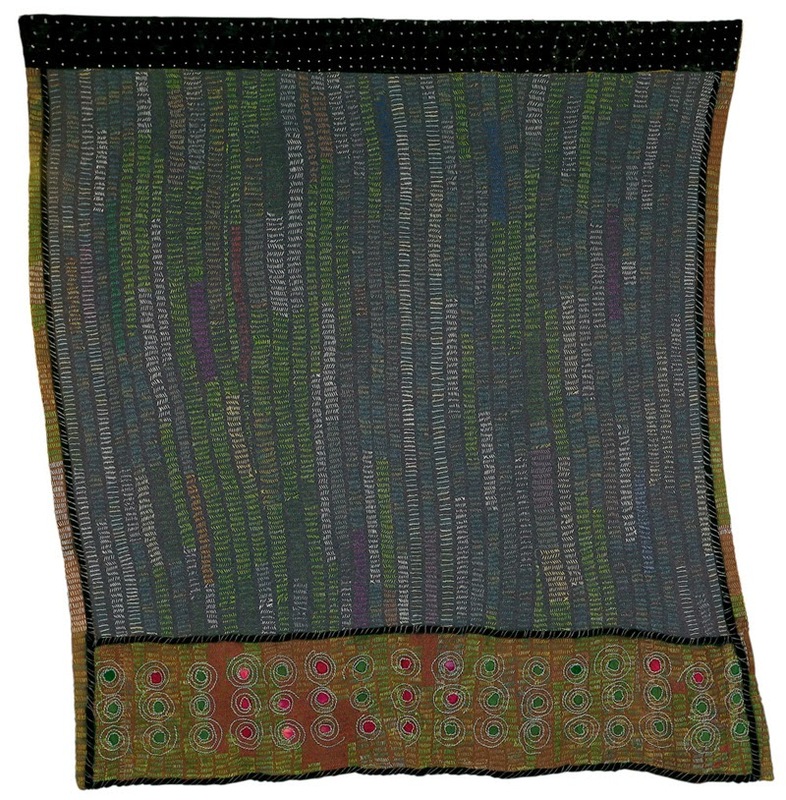 The comfort usually associated with wool blankets is altered and gravity is created: the heavy materials and dark colors have an emotional gravity as well as a physical one.” It has been shipped to St. John's for an exhibition at a craft gallery for the month of April and then will show in Gros Morne from May through October 2015. The importance of touch is a theme that Judy returns to again and again. “The marks made by the wool threads make us want to pet it with the nap, along the grain, up and down and in circles. I do anyway.” She maintains that while we credit sight with being our most important sense, it is touch that unlocks our unconscious memories and dreams. During emotional experiences such as dreaming, listening to music, or caressing our beloved, we close our eyes. Touch is how we know with our heart and body. Our skin is our biggest organ, so touch is an emotional thing. Way to go Judy!! Beautiful work -as usual. thank you Linda. I am pleased with the article. Inspiring and stunningly beautiful! I wish I lived close enough to join in one Thursday afternoon. How nice to hear from you, Mugs. Stunningly realistic - words, thoughts- insight into life and work that goes beyond what we see. Beauty to share and contemplate. Thank you for your compliment, Sharron. You are such an inspiration! Something special happens when one stops thinking of hand stitching as tedious work and starts breathing in harmony with each stitch he/she takes. The creator and creation becomes one. I see that in everything you do. Thank you for being so passionate about your life and sharing your work with the world. 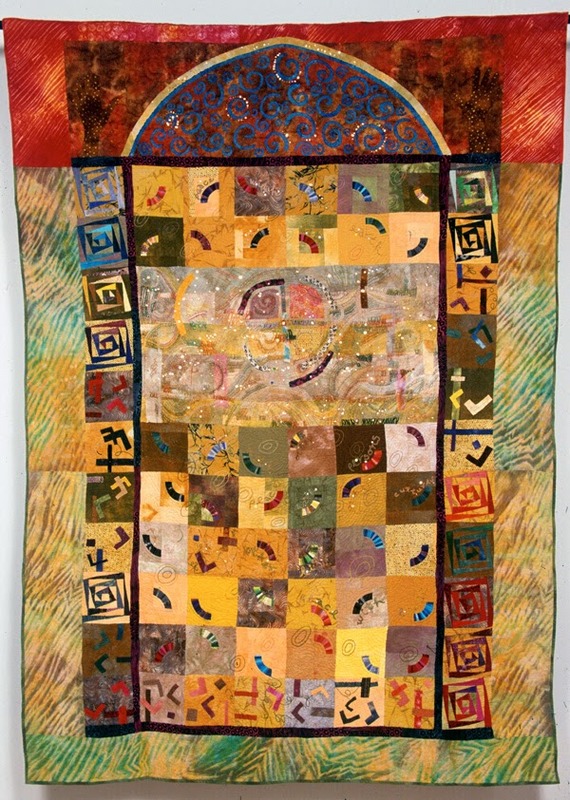 Art Quilts Unfolding: 50 years of Innovation edited by Sandra Sider, launches November 28 2018 and is available through Amazon or the SAQA website, One quilt by Judy Martin is included in this important book.